If you’ve designed your SQL code intelligently and implemented a sensible indexing strategy, there’s a good chance your queries will “fly”, when tested in isolation. In the real world, however, where multiple processes can access the same data at the same time, SQL Server often has to make one process wait, sacrificing concurrency and performance in order that all processes can succeed without destroying data integrity. Transactions are at the heart of concurrency. I explain their ACID properties, the transaction isolation levels that dictate acceptable behaviors when multiple transactions access the same data simultaneously, and SQL Server’s optimistic and pessimistic models for mediating concurrent access. Pessimistic concurrency, SQL Server’s default, uses locks to avoid concurrency problems. I explain all the different locks and their compatibility. I show how to control locking with hints and bound connections, and how to troubleshoot excessive blocking and deadlocking. Optimistic concurrency uses row versions to support concurrency. I explain how row versioning works, cover SQL Server’s two snapshot-based isolation levels and offer troubleshooting tips for issues such as update conflicts. Your application can have world-class indexes and queries, but they won’t help you if you can’t get your data because another application has it locked. That’s why every DBA and developer must understand SQL Server concurrency, and how to troubleshoot any issues. I hope my book helps! 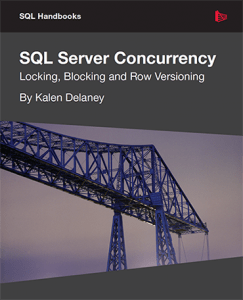 Kalen Delaney has been working with SQL Server for 25 years, and is one of the world’s most respected authorities on SQL Server and a much sought after trainer and speaker. Her book on “SQL Server Internals” is consistently cited as a must-read for aspiring SQL Server professionals.